Have you Named That Sheep yet? Course we could get really scarce names ... like Zahra too.. Another language and time... loose translation -- lady of light. Very sweet dignified name.. course one she may get teased over and being the dignified sheep she is she would be above it! You must be coming to the blog because I see the entries in the Name the Sheep contest piling up. I talked to Farmgirl last night and she had checked the blog to make sure I was getting the postings up - and to make sure we hadn't misplaced any sheep! Leave your comments because she will probably try to check whenever she can. Must get back to my chores - afterall it is lunchtime and Joel (now known as Farmbeau) is hungry again! "Black sheep black sheep have you any wool?" 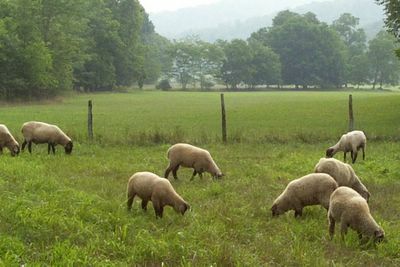 Oh to be on a farm with animals and sheep...do you take weekend visitors ? Sounds like you need to start a bed and breakfast.